Last Spring Chicago's Skybox released a new track, "In a Dream," for free online to build some buzz for Morning After Cuts, their new sophomore LP out this Tuesday. That track was an irresistible dose of musical sunshine so good that during the many months waiting to hear the rest of the record I feared nothing on it could be half as good. I shouldn't have worried. Morning After Cuts is a wonderful alt-pop record that's a joy to listen to all the way through, showcasing a band that's developed a stronger sense of self and a new-found emphasis on melody since their 2006 debut, Arco Iris. "In a Dream" remains the strongest and most immediate cut (someone should tap this for an iTunes commercial), but there's not a dud to be found among the other eight tunes. The breezy, hopeful vibe and clever lyrics of the title track add up to another instant winner, and the upbeat quirkiness of songs such as "Light," "Buckets" and "Fences" offers up indie pop gems that are nearly as infectious as "In a Dream." "Slipping" and "Trout" are slower, more gentle and reflective, serving as a nice balance to the sugar-high throughout the rest of the record. Sean O'Keefe's effervescent production and the distinctive falsetto vocals of singer-songwriter Tim Ellis complete the picture - both work perfectly with the material. This is downright fun, memorable stuff that has the potential to attract a huge audience. 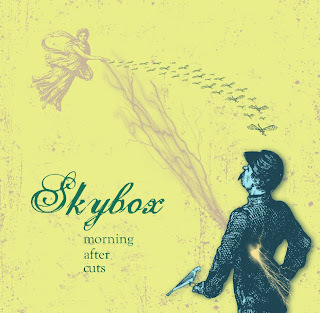 To download "In a Dream" for free and sample other tracks from Morning After Cuts, head to skyboxmusic.com. The band will play Schubas tonight, January 17, as part of Tomorrow Never Knows fest (more info and tickets here). I heard "various kitchen utensils" and absolutely loved the song a few years back and found arco iris online, I was a bit disappointed with the cd. There were maybe three tracks on the cd that I liked. Jukebox the Ghost came to town a few weeks ago and Skybox was the opening band, I didn't know what to expect after their first album, I was just hoping to hear various kitchen utensils, which they did play, but I was blown away. Just seeing the short set they did would have been worth the small price of admission and I doubt I would've gone to a skybox show had they not been opening for someone else, but I left with their new cd and find myself still wanting to listen to it all the time, close to a month after purchase. I don't skip tracks and still find myself repeating songs immediately, especially "buckets". Thanks for the comment, Bret. The band have really stepped it up this time around, huh? "Arco Iris" was fun but MAC is consistently amazing.